The US start-up Atieva – with a number of former Tesla figures behind it – have come up with the first-ever electric V-Class. A monster Mercedes van ready to beat Tesla and Ferrari at their own game. Atieva was founded by former Tesla senior board member Peter Rawlinson and Chinese giant SAIC Motor. The Silicon Valley-based company has decided to present its powertrain mojo in spectacular fashion. Atieva Edna is the name of their first creation, a van made for drag racing. This renovated Mercedes V-class of the previous generation is now free of any combustion engine, using instead the electric powertrain made by Atieva. To test its performance, Edna have pitched the electric V-Class against the Tesla Model S and a Ferrari California. 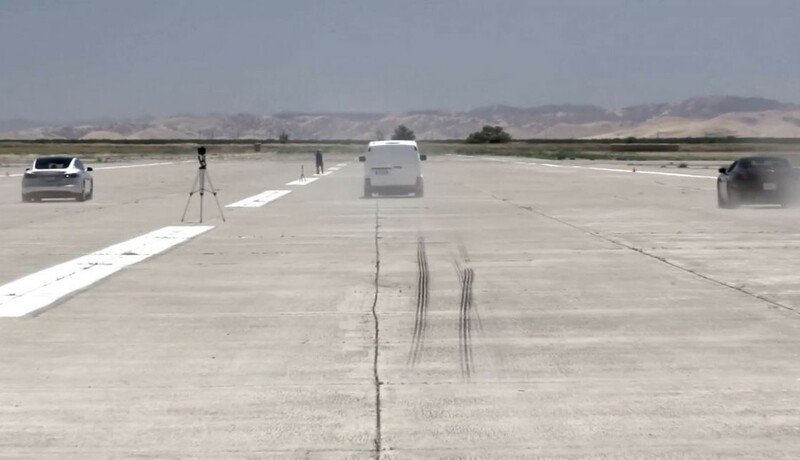 The end result is a winning van in a 3 count to a speed of 60 mph (96 km / h). The Tesla, however, was not in its top version, the P90D with Ludicrous mode. The Edna has two electric motors, two gearboxes and a powerful 87 kWh battery pack to store its power. Total assets must exceed the 900 hp. Atieva has set a goal of bringing to market an electric sedan in 2018. In 2020 and 2021 two crossovers will be added to the family.